Stock #A405SS:IMMACULATE!!! 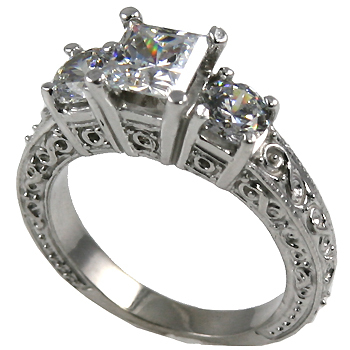 Antique Style Engraved ring.....Sterling Silver.... 1 CARAT RUSSIAN CZ PRINCESS CUT CENTER W/ 2 - 1/2 CARAT ROUND CZ SIDE STONES.... Gorgeous hand-made piece!!! Beautiful, Hand-Crafted, top quality Jewelry workmanship!!!.... Very heavy ring, shank, & prongs.